Brgh brgh brgh and shiver me timbers as John Lad with a pirate voice said, come to think of it there is a cottage near here named Shiver Me Timbers too, good one. Third day without any heating its enough to freeze the cockles, coldest month of the year and the heating has to go on the blink would you credit it. Man is coming out to investigate this Thursday afternoon and if he cant make it that day he will ring me to say he will be with me on Friday morning instead. I am not going to use the same man trader as before complete waste of time. We have the mock woodburner so some heat and my darling son said this morning he has posted off a swish woollen knitted covered hot water bottle which will be arriving tomorrow here. Takes me back to the 50's the hot water bottles. Patch has another appointment at the vet at 3pm just to check his ears over again he has not been itching or flapping his ears so much so thats good obviously the meds have worked. Meant to say vet appointment is tomorrow not today. Have you still got the penguins - here's a seal! My sympathies as to the cold. I suppose it is nothing simple like a fuse in the timing mechanism or a pilot light going out - do oil burners have pilot lights? Do you have a book of instructions that you can check. Otherwise give the boiler a good kick and see if that has an effect. Have you a fan heater? They are good for a temporary fix. If not you could probably order one for next day delivery on Amazon. (They are not expensive. Do you have no hot water either? Hope fixed soon. Well done, Patch, on the ears! Sod's law dictates your heating never packs up in the middle of July when the engineers are twiddling their thumbs. The only sensible thing our predecessors in the house did (their DIY left a lot to be desired) was put in a living flame gas fire to supplement the central heating that fires up with a piezo battery spark, so if our central heating goes phut we can use it instead. Hope they've got to the bottom of Patch's itchy ears, perhaps they could have a look at mine now! Love the Seal, we have a mock electric fire that looks like a real wood burner with logs and flames just switch it on and it lets out lovely hot air Fennie, trouble is every time I switch it on as soon as my back is turned HL turns it back off again. We paid £110 for it. Patch saw the lovely vet Serena who is Spanish by the way, and she inspected his ears again and said now the other ear seems red too so its now both ears. I told vet that Patch has not been scratching his ears and he has not been shaking them so she said that's good. It is a week today since Patch had his bloods done re finding the source of the allergy. Vet said she thought the results would be back by now but when we saw her she said not back yet but that she would phone me when they are. Do you have problems with your ears then FN? if so huge sympathy's. I would have thought that the amount you were saving on oil would pay for your electric woodburner, Even on double bar (2kW) the woodburner would be costing you 30p per hour - say £1 for an evening. How much do you spend on oil? divide this by the number of hours. I would guess you spend at least £2 per day on oil and possibly more - so you see you can pay for quite a bit of electric woodburner from the savings you are making. Silly to be cold. Life's too short. Lovely picture of the fox reading Le Bourgeois Gentilhomme, but what I really want to know is how is he holding the right hand page open without an opposing thumb? 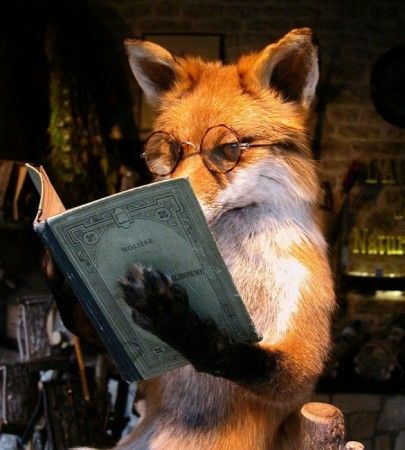 We always knew that foxes couldn't read (or only read badly) and this is why. Now I wonder whether you could fit a fox with a bionic hand and whether it would be worth it? He would have only three legs to run on, but against that he would have a hand and so could brush his hair, clean his teeth, put on his specs and of course turn his pages. Worth dwelling on while you are shivering.